Looking for a work from home career in proofreading, customer service, transcription, or reservations? If your answer is “yes”, you have landed in the right spot. 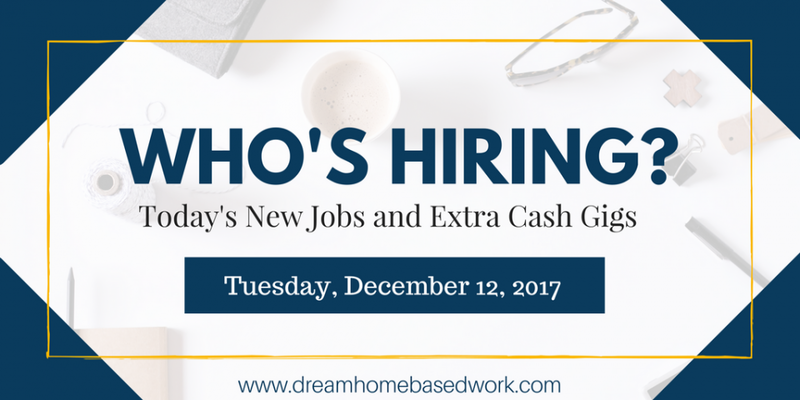 Welcome to this week’s job roundup, where we highlight some of the best job opportunities and other employment from home To learn more about the different types of jobs available, see my new work from home job directory. #1 – Alorica has new openings for Customer Service Representatives. Need to make extra money quickly but don't have a lot of time? Here are 9 of the most promising short task sites to help you earn money fast. #10 – Ask Wonder is seeking students and recent grads for online researching jobs. #11 – Math Elf is seeking Online Tutors. You can make up to $20 per hour. Nationwide opportunity. #12 – Paragon Planners needs Appointment Setters/Schedulers. Only hiring in the following states: AZ, CA, CO, FL, ID, IL, KS, MI, MO, MT, NC, NE, OH, OR, PA, SC, TX, WA & WI. 100 flexible work from home jobs that let you work the hours you want. #13 – SpeakWrite is hiring General Transcriptionists. Full-time and part-time positions available. #14 – Translate.com needs an English Translator. Work on your own schedule. #15 – Test IQ is seeking TV Streaming QA Testers. This is a remote, freelance position. Want more work from home job leads? Make sure to “Like Our Facebook page”. Looking forward to connecting with you.